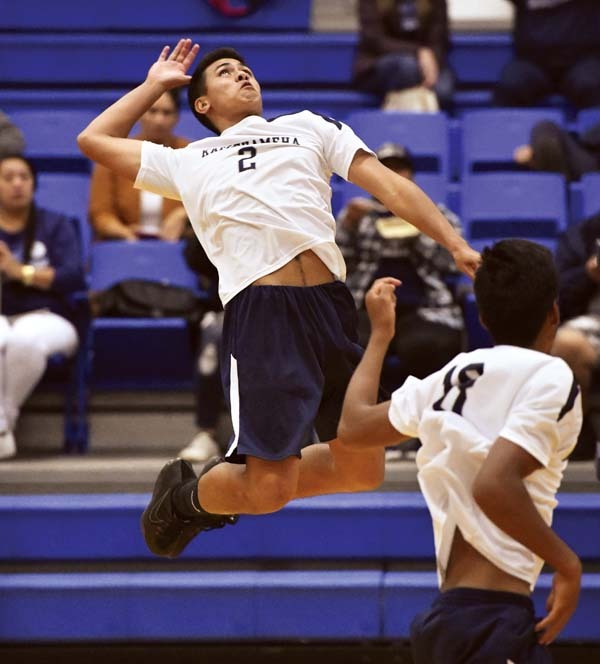 PUKALANI — Last season, the Kamehameha Schools Maui boys volleyball team won the Maui Interscholastic League Division I title for the first time since 2009. 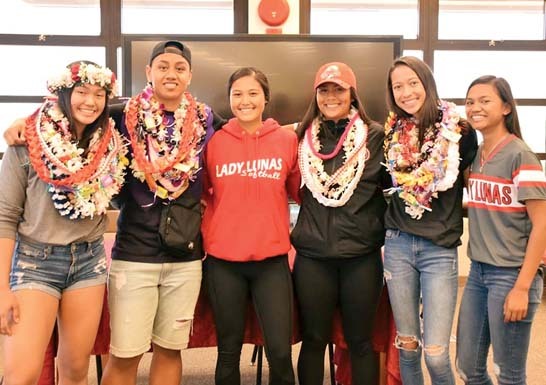 The Warriors still have work to do, but they are guaranteed one thing — they will be going back to the state tournament after a 25-17, 24-26, 25-21, 25-21 win over Maui High on Tuesday night at Kaulaheanuiokamoku Gym. Rafael Adolpho, a 6-foot-1 senior outside hitter, led the Warriors (10-0), although the team did not keep statistics in the match. Kamehameha Maui nailed down the MIL Division I regular-season title with the victory. “It’s pretty big for us, coming back a second year, trying to fight for the MIL title and show what we can do at states,” Adolpho said. Kamehameha Maui rallied from a 15-8 deficit in the third set to help secure the victory over the Sabers (4-6), who played perhaps their best match of the season. 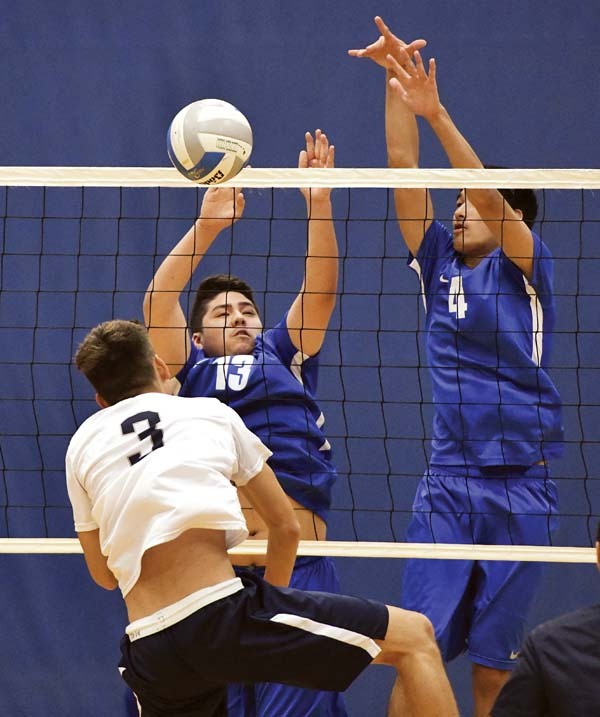 Maui High’s Trent Takara (right) and Matthew Hirose block a second-set shot by Kamehameha Maui’s Noa Vierra. The Warriors broke away from a 9-9 tie in the first set with a 12-4 run. Keoni Rosete had two kills, Adolpho had a kill and two blocks, and Iverson Dudoit had a kill and a block in the run. Kamalu Segundo’s kill down the middle of the court ended the set. The second set was a back-and-forth battle. A kill by Adolpho gave the Warriors a 19-17 lead, and a well-placed roll shot by Jon Aunese gave Maui High a 22-21 lead. Trent Takara gave the Sabers a 25-24 lead and a hitting error ended the set, only the second frame that Kamehameha Maui has dropped in MIL play. Maui High took control with a 7-0 run to take a 15-8 lead in the third set, which began with seven ties on the way to 8-8. Adolpho ended the run with back-to-back kills — off an overpass and a quick-set in the middle from Austin Peters. Kills by Adolpho and Dudoit brought the Warriors within 16-14 and prompted a timeout from Maui High coach Kenny Houpo. 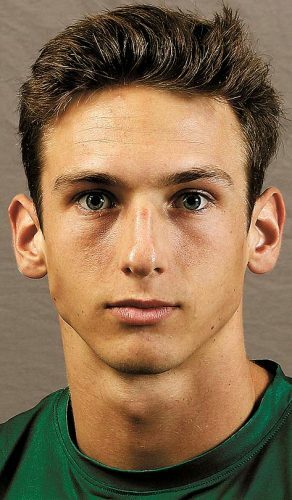 Dudoit’s down-the-line kill made it 16-15 and Adolpho tied it with a middle kill. A block by Tyson Haupu gave the Warriors a 17-16 lead and another Haupu putback made it 20-18. A kill by Haupu made it 23-19 and an ace by Brennan Mendez ended the set. The Sabers took a 14-12 lead in the fourth set on a left-handed kill by Matthew Hirose. Two Kamehameha hitting errors gave Maui High a 16-13 lead before Dudoit’s kill started a 6-0 Warriors run. Maui High closed within 19-18 on a dink by Takara, but Peters smacked a second-hit kill to make it 20-18. Maui High went on a 3-0 run and took a 21-20 lead on a kill by Julius Benavidez. A Sabers’ service error, a kill by Adolpho and a combined block by Adolpho and Peters gave the Warriors a 23-21 lead. Adolpho’s kill wrapped up the match. The Sabers were led by Aunese’s 10 kills and Denniel Carreon’s 30 assists. Kamehameha Maui at Baldwin, 6 p.m.
Hana at Lanai, 7 p.m.
Hana at Lanai, 1 p.m.